With ComfortGel Blue, boasts minimized pressure points, reduced noise, and redirected exhalation air flow away from the sleeping companion. Enhancements that will ensure a better nights sleep for all. This redesigned forehead cushion reduces pressure points for a more comfortable experience. Our one-size-fits-most headgear has EZ Peel tabs and ball-and-socket attachments. It adjusts easily in four places for a secure, custom fit. The lower profile exhalation port with integrated swivel quietly redirects air flow. Now you and your companion can enjoy a better night's sleep. Raise and lower the mask to find the right angle, seal and fit for you. The flap increases comfort improves mask seal and can be removed for easy cleaning. ComfortGel Blue was designed to take full advantage of the Philips Respironics System One Resistance Control. Working together, the device recognizes when adjustments in therapy are required and carries out these adjustments. 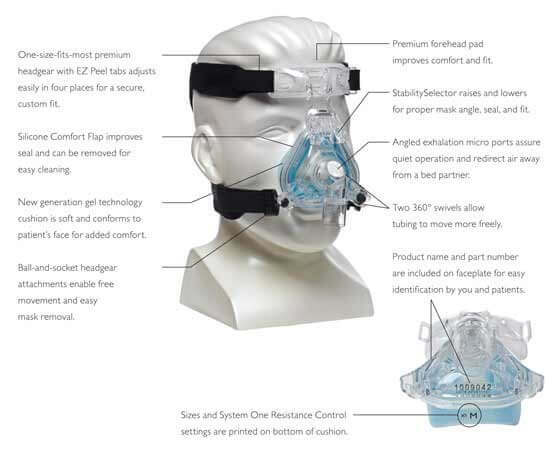 Our blue gel masks have always provided clinicians with an edge. And that’s why the ComfortGel Blue mask stays true to that winning formula by using the latest evolution of our blue gel technology. The soft, pliable blue gel readily adapts to facial features, thereby simplifying fit and contributing to extended wearer comfort. The redesigned forehead cushion reduces pressure points for a more comfortable experience. Premium headgear makes fitting and adjustment a snap and helps maintain a proper seal. Together, these features create a higher level of comfort and more stability than ever possible. Sometimes a little enhancement can go a long way for everyone. We developed a lower profile exhalation port with an integrated swivel that quietly directs air flow up and away from a bed partner. Now, you and your companion can enjoy a better night’s sleep. It all adds up to help you fit 100%, 100% of the time. Experience how an even higher level of comfort has enhanced the overall experience and will make ComfortGel Blue a mask your number 1 choice.